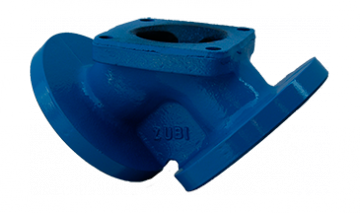 The T100E angled shape Diaphragm valve is manufactured with a cast iron monoblock body. Depending on the fluid being used, the bodies can be internally lined protecting from aggressive chemical attacks. Easy maintenance: Three part design allows maintenance and actuator replacement of parts without removing the valve body from the pipeline. Handwheel: comfortable grip, easy to use for fast operation, saves time and effort. Diaphragm: provides positive shutoff and isolates all working parts from line fluid. DIN PN10/PN16 and ASA 125/150. GG25, GGG40, GGG50, A216 WCB, SS316 (CF8M), CARPENTER20 (CN7M).